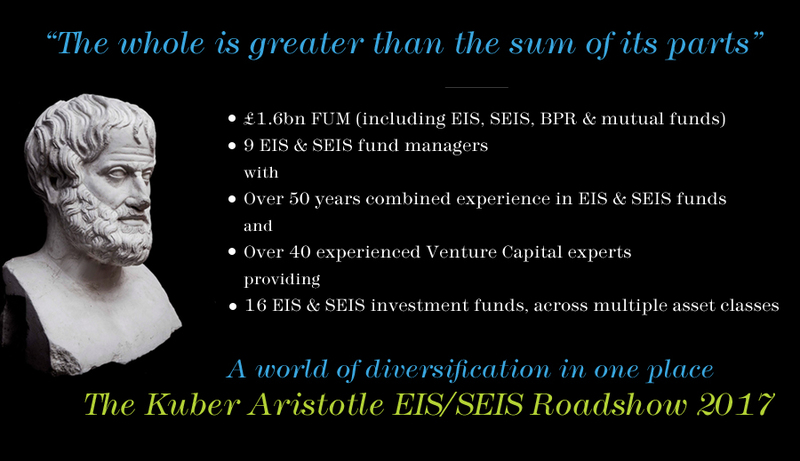 The Kuber Aristotle EIS/SEIS Roadshow clearly exemplifies “the whole is greater than the sum of its parts” with 9 managers on the road showcasing a collective strength and depth covering a multitude of different industries, sectors and asset classes including; Real Estate, Technology, TV, Pubs, Waste Management, Restaurants, Gyms, Film, Storage, Shipping, Music, Life Sciences, Plant & Machinery, Luxury Goods, Nurseries, Recycling, Nursing Homes and Crematoria. Kuber is delighted to invite you to register and join us on the Roadshow and learn more about this magnificent collective offering. This Roadshow have been specifically designed for Advisers who are specifically involved with providing investment advice to high net worth individuals. There will be two streams of Manager presentations running simultaneously it is therefore important that you select which managers you would like to see through the drop down menus below and selecting 1 to 9, (or 13 in the case of the London Seminar. The ranking starts with 1 as top priority). - *Press and hold the Ctrl key, click each item you want to select, and then release the Ctrl key. I have not prioritised any of the providers, as I don’t know enough about each one. That is fine. If you don’t have the priorities – just put 1 against all of them. I’m not familiar with any of these providers and accordingly have left them all as showing ‘1’. Thank you. That is fine.